We’d love your help. Let us know what’s wrong with this preview of Love Without End by Robin Lee Hatcher. Kimberly Welch, wido Chet and Kimberly have both failed when it comes to love. Will they risk their hearts to love again? To ask other readers questions about Love Without End, please sign up. When will the rest of this series be out in the e-book version? In Love Without End, Robin returns to Kings Meadow, Idaho, the setting that I fell in love with in her previous novel, A Promise Kept. If you look at the cover and decide to pass, assuming this is just another typical "city-girl-meets-handsome-cowboy" romance, you will be mistaken and miss out on a moving story. In Love Without End, Robin skillfully pens a narrative with deep emotion and a maturity that has to have come out of life experiences. She writes of the brokenness of life, of broken people, of loss, and how we handle the unexpected. And that "unexpected" even becomes a second chance at love, born out of a seeking and surrender to God's will, for two characters could hardly be more wrong for each other on the surface. I found Chet and Kimberly to be appealing and realistic, easy to relate to through their losses and struggles. Single parent Chet loved Kings Meadow, the close community, the land, and the Leonard Quarter Horse Ranch that had been in his family for generations - yet he felt he had let his family and God down. Prior to personal and financial losses, Kimberly had lived a rather shallow, surface-level life: "Once she'd been the stay-at-home wife of a prosperous businessman and the mother of a bright and popular daughter. Now she was a financially struggling widow, unable to find employment after too many years out of the job market, and mother to a hurting, sometimes sulky teenager whom Kimberly hardly recognized as the joyful child she'd raised." And then there's the beloved 84-year-old Anna McKenna, whose story is seamlessly interwoven from 1944 to the present day, adding much richness through the insight into Chet's family heritage and her never-failing faith. I love it when an elderly character is featured in a story, and the fact that my grandmother and I were very close not only deepens my connection to Love Without End, but takes it to another level. Chet's boys, Sam and Pete, and Kimberly's daughter, Tara, also feature prominently in this story, and I hope we see more of them. I especially delighted in Tara's love for horses and the way she blossoms through the Leonard family and the Kings Meadow environment. I expect Christian fiction to not only entertain, but to inspire, challenge, or move me in some way, and Love Without End did exactly that. The beauty of a setting that felt like a main character, Anna's life journey, the support of the Kings Meadow community, and the welcoming acceptance the Leonard family offered all combined into a poignant and heartwarming read. I'd like to end with one of my favorite quotes, spoken by Anna to Chet: "Some folks say God never gives us more than we can handle. I don't believe that's true. He doesn't give us more than He can handle. The battle belongs to the Lord. Let Him fight it for you." Love Without End is a story that touched me. A 5-star rating for that touch. This was a good book. I enjoyed the relationships. It was fun to read a romance about a couple in their forties with teenagers. Although there was very little romance. The ranch life was a small part of this story. I always like to read about horses. It brings back memories of when I was young and able to ride and spend time with horses. I have the other two books in this series and plan to read them in the future. Love Without End is first in the Kings Meadow Romance series by Robin Lee Hatcher. This is a contemporary Christian romance blended with short chapters that take place in the past, as early as 1944. The hero, likable rancher Chet Leonard, was first seen going through tough times as a secondary character in A Promise Kept, which is listed on Hatcher's website as being a stand alone women's fiction. Chet is now focused on running his ranch and raising his two teenage boys, Sam and Pete. The heroin Love Without End is first in the Kings Meadow Romance series by Robin Lee Hatcher. This is a contemporary Christian romance blended with short chapters that take place in the past, as early as 1944. The heroine Kimberly Welch is new on the scene, recently widowed and penniless. She has moved to King's Meadow with her teenage daughter Tara to accept the help of her best friend until she can support herself financially. We also have honorary grandma "Nana Anna," who has recently returned to King's Meadow to live with the Leonards. We see her back story interspersed throughout the novel. Anna was many reviewers' favorite character! *Robin Lee Hatcher does a great job of incorporating aspects of Christian faith into her story. I've found this to be the norm for Hatcher! *The characters are all very likable. *I enjoy contemporary novels that don't feel overly contemporary. The story was very clean and managed to feel a bit old-fashioned. If I didn't find contemporaries like this, I'd never read contemporary fiction. *I felt that the romance was a bit slow. Natural, yes, but slow. This is the only reason I'm giving it four stars rather than five, because I thought the story itself was great. I really think that a romance needs a bit more interaction between the main characters. Hatcher writes an amazing story that keeps you turning the pages anxious to see what is going to happen next. Chet and Kimberly have been through some of the hardest things that you can imagine, but both are still doing the best they can. The last thing either of them want to do is fall in love again. Especially when Kimberly wants to live in the city, and Chet can’t live anywhere but at his ranch. They both have their own kids to worry about, and don’t need any more complications. But God often Hatcher writes an amazing story that keeps you turning the pages anxious to see what is going to happen next. Chet and Kimberly have been through some of the hardest things that you can imagine, but both are still doing the best they can. The last thing either of them want to do is fall in love again. Especially when Kimberly wants to live in the city, and Chet can’t live anywhere but at his ranch. They both have their own kids to worry about, and don’t need any more complications. But God often has a better plan for our lives than we could ever imagine. This story bounces back and forth from current times to some of Chet’s Nana Anna’s past. Nana Anna was one of my favorite people in the book. I loved how throughout the story we got too see bits and pieces of what makes Anna who she is. You can’t help but love her, and want to be a lot like her when you are her age. Kimberly’s daughter Tara is a teenager that has had her life uprooted since her father died. She is very self centered, like any teenager is. When she is given a horse, her life changes for the better. She has wanted one forever, and barely holds on to the hope that she will get to keep it. When Chet steps in to help her learn the ropes she blossoms. Her dreams are finally coming true. How will she get along with Chet’s sons Sam and Pete? What would she do if she is forced to leave the place she loves? I would recommend this book to anyone who enjoys historical fiction along with Contemporary fiction. Hatcher is an awesome author who makes you love the characters and want them for friends in real life. A must read! I received a copy of this book from Thomas Nelson and Net Galley for my honest opinion. All opinions expressed are my own. I had such a good time reading this book. I enjoyed it from start to finish and felt very connected to the characters and the beautiful setting of King’s Meadow, Idaho. Both Kimberly Welch and Chet Leonard have known heartbreaking loss in their lives. Both have lost loved ones and are working through the hurt in their own ways. Kimberly is also trying to get back on her feet financially and worries about how her teenage daughter is handling the trials they have both endured. I enjoyed reading abou I had such a good time reading this book. I enjoyed it from start to finish and felt very connected to the characters and the beautiful setting of King’s Meadow, Idaho. I enjoyed reading about the way Kimberly grew throughout this story. From her realization that she had begun to live a relatively shallow life that was dominated by luxury before her husband passed, to the way she started to understand as time passed, that she needed to give all of her hurts and questions over to God and trust in Him to provide the answers. Chet grew throughout the story as well. His faith was strong and he relied on God to get him through the days, but he worried about the possibility of starting a new relationship and if it was worth the potential for heartache. Learning to give those fears to God was an important step in his life. The beautiful setting of King’s Meadow and Chet’s horse farm made for such nice reading. I felt like I was there, in the midst of the beautiful mountains and majestic horses. Absolutely lovely! I received a complimentary copy of this book from the publisher, through Litfuse Publicity, in exchange for an honest review, which I have given. Quick read. Predictable but sweet story. I did feel it was a little flat. No real conflict, except in their own minds, and not enough of the romance for my taste. I like it clean, but this felt almost nonexistent. I mean, the fist kiss was mentioned as part of a very brief memory of the night before. Come on. Mrs. Hatcher has done it again people. I literally can not get enough of her books. They give me all the feels. The setting of Kings Meadow was perfection and Nana Anna made this book amazing. After all the murder and mayhem I read, I needed this sweet read. Totally loved it! I loved Chet and Kimberly's story! I love Robin Lee Hatcher's romances! She just has a way of telling them that makes you love them, and want to see the people in her stories live happily ever after! But in this book like all of hers I've read, she is real with her romances, too. There were issues this couple had to over come, past loves they had to get over. Both had been married and both were hurt in there marriages, so they had to learn to trust one another. This story also weaves in the story I loved Chet and Kimberly's story! I love Robin Lee Hatcher's romances! She just has a way of telling them that makes you love them, and want to see the people in her stories live happily ever after! But in this book like all of hers I've read, she is real with her romances, too. There were issues this couple had to over come, past loves they had to get over. Both had been married and both were hurt in there marriages, so they had to learn to trust one another. This story also weaves in the story of a family friend, who was more like family, she had been a part of Chet's family since before he was born. Her name is Anna. Anna is so precious! Her love for the Lord shined through, and her love and encouragement was wonderful and it helped this couple and there children so much! Robin Lee Hatcher is a hit or miss author for me. I absolutely love some books. Others, not so much. This was a good book, but not one of my favorite Robin Lee Hatcher books. It was kind of sad. I felt bad for all the characters in this book, even the horse, and wanted it to work out for them. All the characters had difficulties to work through and plenty of room to grow. Half historical and half contemporary, this is a book to appeal to fans of both genres. If you love prairie romance (whether Robin Lee Hatcher is a hit or miss author for me. I absolutely love some books. Others, not so much. This was a good book, but not one of my favorite Robin Lee Hatcher books. It was kind of sad. I felt bad for all the characters in this book, even the horse, and wanted it to work out for them. All the characters had difficulties to work through and plenty of room to grow. In many ways, Chet and Kimberly are very different; she, from the city, and he an Idaho rancher. But they have both experienced extraordinary loss. They meet when Kimberly comes to the area to stay with her best friend because she believes she has nowhere else to go. Can they make a life together? And will they make that choice? This book is rich in characters and the stuff life is made of. It is real and down to earth, and not a glossy romantic love story--but a love story, just the same. I am l In many ways, Chet and Kimberly are very different; she, from the city, and he an Idaho rancher. But they have both experienced extraordinary loss. They meet when Kimberly comes to the area to stay with her best friend because she believes she has nowhere else to go. Can they make a life together? And will they make that choice? I truly enjoyed Love Without End. This, the first book in the King's Meadow romance series, entwines two beautiful and heartfelt romances--one in the past and one in the present. Together they make this a special read. I'm so glad Robin wrote a love story for Chet who suffered so much in A Promise Kept (January 2014). Kimberly, so wrong for him, becomes so right. Not your run-of-the-mill cowboy romance--enriched with deft writing and deep emotion. I just could not get into this book. I must be the only person out there that doesn't want to live in King's Meadow. I also don't like horses. Seems to be a prerequisite to bonding with this book. good read, I had to take a break from MR. PATTERSON! lol good story line, christian theme. Absolutely one of the best I've read. Keeps you turning the pages as fast as you can. I really enjoy Robin's books. Her stories of God's love, forgivness, romance, life storms and faith just reel me in. It is very hard to put her books down once I start them. Another great book in this series! I have really enjoyed the characters and the storyline in this series. I look forward to reading more of the series. Love story of second chances for Chet and Kimberly. With raising teen ages, the ranch and horses they all found love and a home. Their stories alternate thru the books. After reading A Promise Kept, this one was not at the same caliber. It was pretty boring. For me, there has always been a flair for romance and the love of horses for as long as I can remember. Just looking at the cover of a novel that pairs a young woman and a man wearing a cowboy hat is enough to make me sigh! Couple that with a great premise of two people who have experienced loss in their marriages that make them both not sure if they are ready to get back in the saddle for romance or love anytime soon. Robin Hatcher takes her readers back to a much loved setting she wrote about For me, there has always been a flair for romance and the love of horses for as long as I can remember. Just looking at the cover of a novel that pairs a young woman and a man wearing a cowboy hat is enough to make me sigh! Couple that with a great premise of two people who have experienced loss in their marriages that make them both not sure if they are ready to get back in the saddle for romance or love anytime soon. Robin Hatcher takes her readers back to a much loved setting she wrote about in A Promise Kept where she vowed to help Chet Leonard find a second chance at love again. She begins her latest series of novels with Love Without End. It's a timeless story of second chances and how much more full our lives are when we are given a second chance at happiness and love when we least expect it. Chet Leonard has been trying to come to terms with why his wife left him and his three sons after the death of their oldest son, Rick. She simply up and left, subsequently divorcing him after leaving the ranch. Not sure it was because life with Chet would be forever a reminder of Rick, but it definitely left Chet believing that love had all but forgotten him and headed for the sunset instead. Now he was struggling with how to keep the ranch profitable after a lifetime of being in his family for generations. He would surely hate to lose it all now. Thankfully just having Anna moving back into the guesthouse after losing her husband would help give them hope again. Even though she wasn't family by blood, the Leonard's legacy was kept alive but the day Anna showed up on their land back in the early 1940's. Kimberly Welch could hardly believe that life had taken the turn it had. A dead end is more likely where she found herself. Her husband death at 40 from a sudden and unexpected heart attack would have thrown anyone for a loop. But it was what he hadn't shared with her in their marriage that made trust an issue. Leaving them with more debt than they could manage, she lost first her husband, then her house and car and finally everything she owned except for her fifteen-year-old daughter Tara, and it looked like she was slowly losing her every day that went by. Thankfully her friend Janet, stepped in and offered them a place to stay so they wouldn't have to live on the street and along with that, a gift of a horse, for Tara to enable her to find her way back to life again. They only needed to convince Chet Leonard to help them break the horse in for Tara after being neglected by its previous owner. But is love without end or simply a detour in two broken lives and hearts? Only time will tell in this amazing novel! Robin Lee Hatcher is the best-selling author of over seventy books. Her well-drawn characters and heartwarming stories of faith, courage, and love have earned her both critical acclaim and the devotion of readers. Her numerous awards include the Christy Award for Excellence in Christian Fiction, two RITA® Awards for Best Inspirational Romance, Romantic Times Career Achievement Awards for Americana Romance and for Inspirational Fiction, the Carol Award, the 2011 Idahope Writer of the Year, and Lifetime Achievement Awards from both Romance Writers of American (2001) and American Christian Fiction Writers (2014). Catching Katie was named one of the Best Books of 2004 by the Library Journal. Robin began her writing career in the general market, writing mass market romances for Leisure Books, HarperPaperbacks, Avon Books, and Silhouette. In 1997, after several years of heart preparation, Robin began to write stories that included the faith life of her characters and she hasn't looked back since. She has written both contemporary and historical women's fiction and romance for a number of trade publishers (Thomas Nelson, Zondervan, Revell, Steeple Hill, Tyndale House, Multnomah, and WaterBrook). Robin enjoys being with her family, spending time in the beautiful Idaho outdoors, reading books that make her cry, and watching romantic movies. Robin and her husband make their home on the outskirts of Boise, sharing it with Poppet the high-maintenance Papillon, and Princess Pinky, the DC (demon cat). Kimberly Welch lost her husband to a heart attack almost three years ago. As a result of that she lives with her best friend. Due to her lack of funds, she really doubts she can afford the lessons her daughter needs after recently been given a very rowdy pinto. Chet Leonard's wife abandoned both him and their two boys, after their third son died in a car accident. Now he does all he can to provide and care for the family that he has left. Chet agrees to tame Kimberly's daughters horse for her but only if she will help around the ranch. As her daughter helps out around the ranch she grows closer to 84 year old Anna McKenna. Everyone loves Anna so there is no wonder she has become attached to the older woman. Soon everyone learns the connection this woman has to the Leonard family. If you are interested in learning more, you can here. Robin Lee Hatcher is a great author that develops her characters well. She can take any situation and make a story out of it. Love Without End is a story that shows us love can exist even after it seems that all attempts are exhausted. Another reviewer wrote, “THIS IS A MUST READ! But warning: You can NOT put it down!” I couldn’t agree more. This is the first book I’ve read by ROBIN LEE HATCHER. Before I completed it, I was looking up others books by her and quickly made a purchase, THE SHEPHERD’S VOICE. Involved in prison ministry, it immediately captured my attention. And guess what? I just started it and I CAN’T PU IT DOWN. But enough about THE SHEPHERD’S VOICE, for that is a review for another day. LOVE WITHOUT END: A KINGS Another reviewer wrote, “THIS IS A MUST READ! But warning: You can NOT put it down!” I couldn’t agree more. This is the first book I’ve read by ROBIN LEE HATCHER. Before I completed it, I was looking up others books by her and quickly made a purchase, THE SHEPHERD’S VOICE. Involved in prison ministry, it immediately captured my attention. And guess what? I just started it and I CAN’T PU IT DOWN. But enough about THE SHEPHERD’S VOICE, for that is a review for another day. LOVE WITHOUT END: A KINGS MEADOW ROMANCE (BOOK 1) by ROBIN LEE HATCHER is truly a must read. I have found a new favorite author in MS HATCHER. I cannot wait to devour more books by this amazing writer. If only one day I could write half as well as she. Kimberly Welch lost her husband a few years back, and now she fears she is losing her daughter. Left in financial ruins after her husbands death, Kimberly moves in with an old friend until she can find work. Chet Leonard lost his teenage son in a car accident, and then his wife to abandonment. Chet and his two remaining sons are getting along just fine. The last thing he needs in his life is a woman who has no intentions on staying in Kings Meadow once she finds a job in the area and lifestyle she is accustom to. Where do I begin? MS HATCHER novel, LOVE WITHOUT END: A KINGS MEADOW ROMANCE (BOOK 1) checks off everything on my list of what makes a great story. Three dimensional characters you will fall in love with, great pace, wonderful plot, flawless writing, great beginning, middle, and end. When I read I tend to critique. You know a book is great when I forget about critiquing and immerse into the story that grabs holds and doesn’t let go. It is a rare storyteller who can completely captivate a reader, but Robin Lee Hatcher does so with ease in her latest release, Love Without End. This incredibly well-written romance has an impeccable storyline, an outstanding cast of characters and a beautiful setting. The novel is, quite simply, a spectacular and riveting read that I highly recommend to anyone who enjoys faith-based fiction. 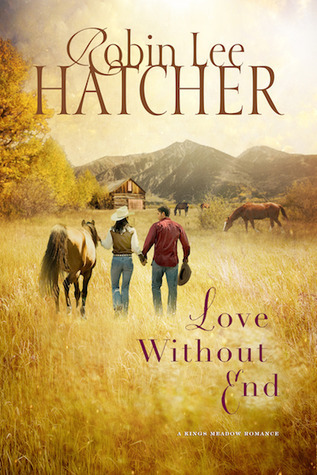 In the beautiful mountains of Idaho, two people who have suffered terrible losses must decide if they are It is a rare storyteller who can completely captivate a reader, but Robin Lee Hatcher does so with ease in her latest release, Love Without End. This incredibly well-written romance has an impeccable storyline, an outstanding cast of characters and a beautiful setting. The novel is, quite simply, a spectacular and riveting read that I highly recommend to anyone who enjoys faith-based fiction. In the beautiful mountains of Idaho, two people who have suffered terrible losses must decide if they are willing to risk their hearts again. Chet Leonard is deeply rooted to his family owned quarter horse ranch while newcomer Kimberly Welch is planning to leave as soon as she finds a job back in the city. Both have survived tragic losses and are now raising their children on their own. Chet was dealt a double blow when he lost his son, Rick, in a car accident and his wife, Marsha to divorce. He has his hands full running the ranch with the help of his two teenaged sons, Sam and Pete and a couple of ranch hands. In the aftermath of her husband's sudden death, Kimberly discovers their lavish lifestyle has, quite literally, bankrupted her. A good friend offers Kimberly and her fifteen year old daughter Tara a place to stay while she gets back on her feet. The unexpected gift of a horse brings the two families together and love begins to bloom between Chet and Kimberly, but will their fears keep them apart? Chet is a man of strong faith who is very committed to his family. He is a loyal friend who can always be counted on to lend a helping hand to anyone who needs it. His divorce devastated him and has left him doubting whether he is husband material. So when Chet finds himself drawn to Kimberly, he is uncertain whether he should invest his heart in another relationship. Kimberly is pretty much a big mess for much of the novel. She lets her fears rule her life and she is quick to lash out when faced with change. She clings tightly to her certainty that small town life is not for her and despite the positive changes in her life, she still plans to leave when a better opportunity comes along. Kimberly also has some trust issues that stem from her marriage and she is very reluctant to date Chet despite her growing attraction to him. Equally intriguing is honorary grandmother Anna McKenna's story. She, too, has a somewhat tragic past, but in spite of her hardships, she remains upbeat, positive and very young at heart. Through flashbacks, her life on the Leonard ranch comes vibrantly to life and it is fascinating watching her maintain her faith and express appreciation for all of the blessings she has received.